Candy from Poland! 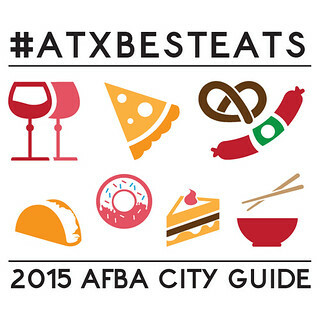 | bake me away! 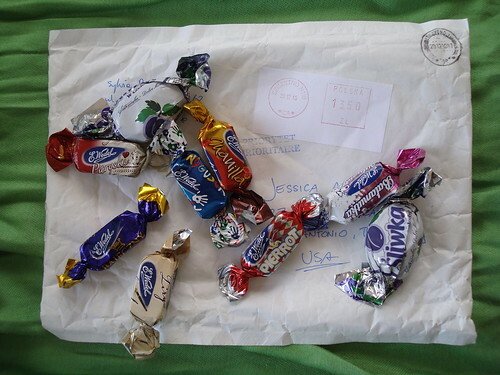 A few days ago, I received a package filled with chocolates from Poland! 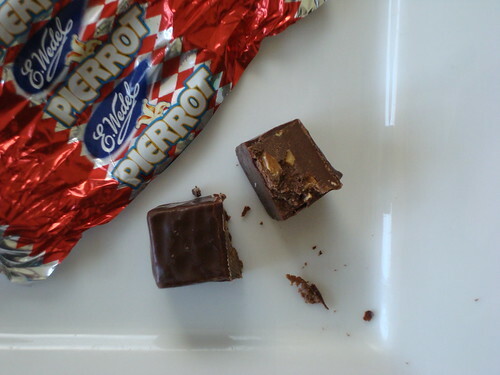 The first chocolate I tried was called Pierrot. (I chose it first because of the name – he’s the sad clown! 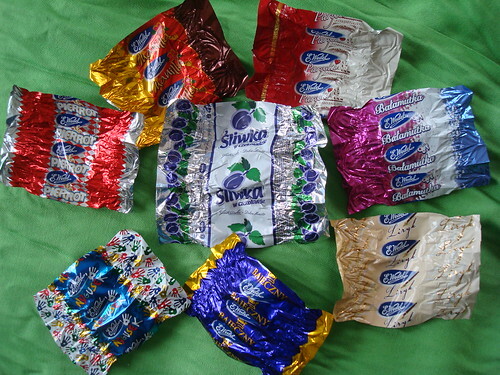 Yet this wrapper is like Harlequin‘s clothes?) When I opened it, it smelled like peanut butter, but it didn’t look like PB. The filling was chopped peanuts (hmm, circus peanuts?) mixed in smooth milk chocolate. Tasty! I then tried Bajeczny. Let me say that I am glad this is a blog and not a vlog because I would have no clue as to how to pronounce these. This one just smelled like chocolate as far as I could tell. 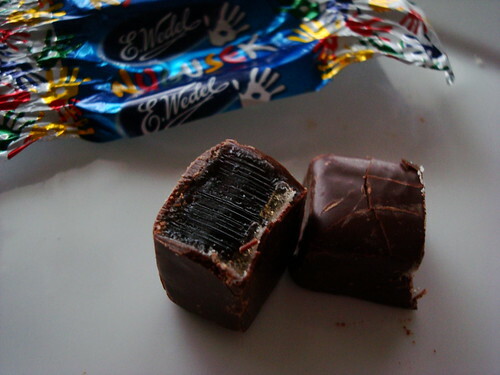 When I bit into it, it was very similar to the Pierrot, but with bits of either puffed rice or wafers instead of peanuts. The last of that day: Liryk. (Is that a composer’s pen?) I thought this one smelled kind of like coffee, but when I cut into it, it looked like I was wrong. It turned out to be smooth white chocolate with tiny bits of something for crunch. I’m pretty sure they were flecks of almonds, but could be wrong. The other that I tried yesterday was Nygusek, and it was so interesting! I couldn’t figure out if it smelled like Coke (love) or licorice (hate). When I cut into it, it had a dark jelly center which didn’t help clear things up. Biting into it though, it was definitely a Coke flavor, and I loved it! I never would have thought I’d like a chocolate/Coke combo even though chocolate Cokes exist in some places. Today I finished them off, starting with Paryski (Paris?). This one smelled fruity, but in a nondescript way. Cutting into it was like the last because it also had a jelly center, this time dark pink. The flavor of it was (I think) cherry, but possibly raspberry. Either way, this was a definite favorite! 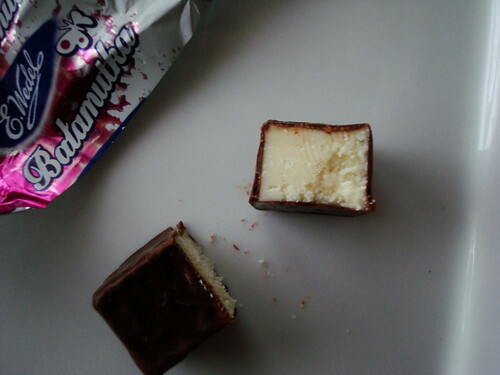 It reminded me of a mild version of Cadbury’s Turkish Delight. 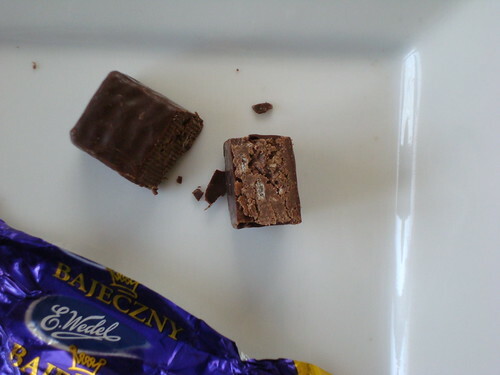 Then I found out that the brand (E. Wedel) is Poland’s Cadbury company. So there you go. 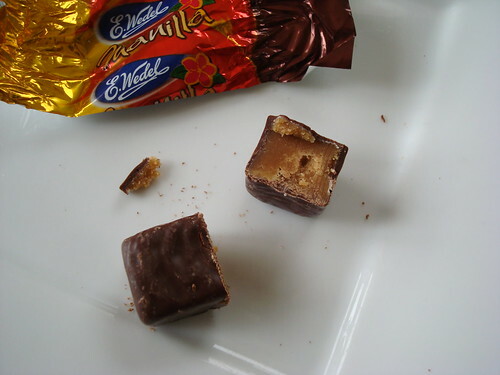 The last of the rectangular chocolates was Manilla. It smelled like vanilla as predicted from the name. It was more caramel-colored than the Liryk and had a rich vanilla flavor. The texture was also different from the Liryk, and seemed very familiar. I guess it reminded me of a super dense (i.e. 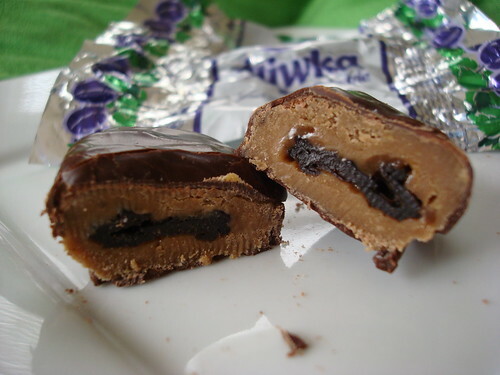 not runny) Cadbury creme egg? 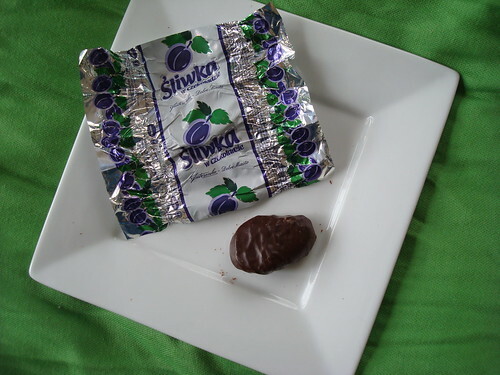 Last but definitely not least is the Sliwka. In fact, this was actually the first one I tried, but Sylwia sent five! As you can see, this one is already quite different from the others since it’s not rectangular. You can probably also guess from the wrapper what’s inside: a plum! Okay, technically a prune since it’s dried. The filling that surrounds the plum is similar to that of the Manilla texture and taste-wise, and the plum itself is moist because it’s in a syrup. Overall, I feel like this one has a slight coffee flavor, and it’s super delicious. Another favorite! It makes me think I’d actually like one of those chocolate prune cakes. 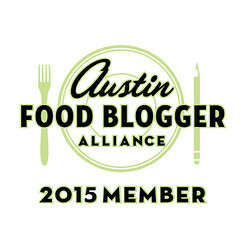 Also, while we’re on the topic of Christmas packages, look at what Lauren from veg:ology sent me a few weeks ago! 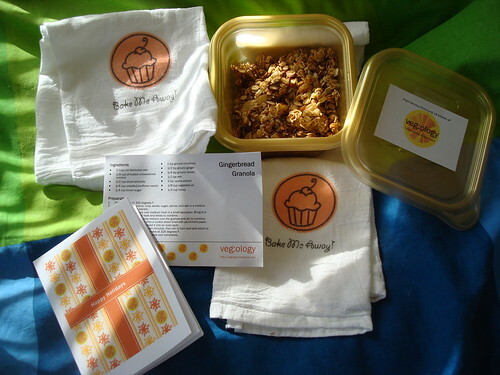 That’s some super tasty homemade gingerbread granola (with the recipe), and yes: those are personalized kitchen towels. Dang! She’s awesome and you should check out her blog. Thanks again, Lauren! This post is brought to you by nice people. They’re nice. Very nice reviews and pictures. I have a difficult time getting focus on the centers of the chocolates sometimes, and yours turned out perfectly. 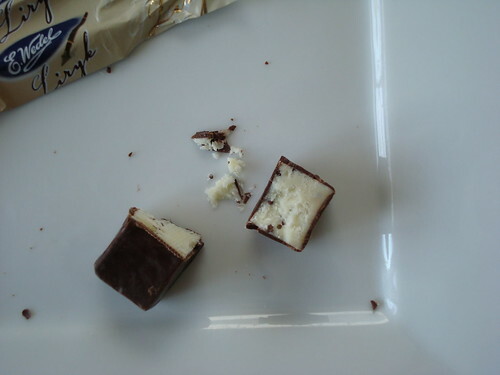 My bet is that with the Liryk had a coffee smell from the dark chocolate couverture (at least it looks dark). Very common taste/aroma undertone for dark chocolate. Liryk is a poet who writes lyrical poetry or it’s a lyrical poem. Bałamutka (read “ba:wa:’mootka”) is a flirtatious or coquettish woman. Nygus is an old word for an urchin or a lazy bum. Paryski means Parisian. Paris is “Paryż”. Śliwka is of a different brand, Jutrzenka (read “yout’shenka”). I know this special shop where I can always get some fresh plums in chocolate and I wanted you to try them in this juicy syrup. Liz – Care packages are awesome, but even better when they’re filled with chocolate! I definitely hadn’t before this. And I was going to give you one of the prune ones, but forgot to bring it with me and ate it. oops. i’m so in love with this post. love your honest review on the candy. Pingback: Monteith’s Brewery: Greymouth, NZ | bake me away! Thank you so much for this detailed review! I recently bought a variety bag of these candies from a Polish store. My daughter just started with the Nygusek because of the primary colors, it looked kid friendly. We were wrong! Thanks to your review, she’s open minded to trying the others. 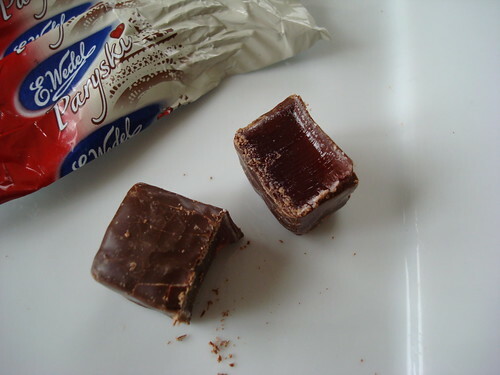 are polish candy/chocolate gluten free as I have been given some by a friend….and I am coeliac? Ask your friend about “Wawel”. Their candy is equally good (if not better). Wawel? no no, never, of course it’s good, but I don’t like wawel (I’m from Poland), the best are Solidarność http://www.solidarnosc.pl/ and the best of the best are Trufle from solidarnosc, next is wedel, and next wawel. I totally miss spelled the website.